• The height above the ground when the emergency occurs. • Excess airspeed (excess airspeed can be converted into distance and/or altitude). Figure 16-1. Using vegetation to absorb energy. Deactivation of the airplane’s electrical system before touchdown reduces the likelihood of a post-crash fire. However, the battery master switch should not be turned off until the pilot no longer has any need for electrical power to operate vital airplane systems. Positive airplane control during the final part of the approach has priority over all other considerations, including airplane configuration and cockpit checks. The pilot should attempt to exploit the power available from an irregularly running engine; however, it is generally better to switch the engine and fuel off just before touchdown. This not only ensures the pilot’s initiative over the situation, but a cooled down engine reduces the fire hazard considerably. • Wind direction and velocity. • Dimensions and slope of the chosen field. • Obstacles in the final approach path. These three factors are seldom compatible. When compromises have to be made, the pilot should aim for a wind/obstacle/terrain combination that permits a final approach with some margin for error in judgment or technique. 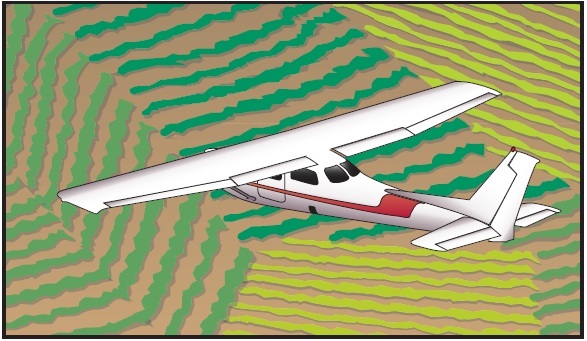 A pilot who overestimates the gliding range may be tempted to stretch the glide across obstacles in the approach path. For this reason, it is sometimes better to plan the approach over an unobstructed area, regardless of wind direction. Experience shows that a collision with obstacles at the end of a ground roll, or slide, is much less hazardous than striking an obstacle at flying speed before the touchdown point is reached.